Few destinations on earth cause as much amazement as Riviera Maya. What makes this destination special is the privileged location on Mexico’s Yucatan Peninsula, where the turquoise waters of the Caribbean Sea embrace the powdery white sand of the beaches that cover the coastline. The 120 km of Caribbean coast that stretches the length of Riviera Maya exudes the multifaceted spirit of the destination. 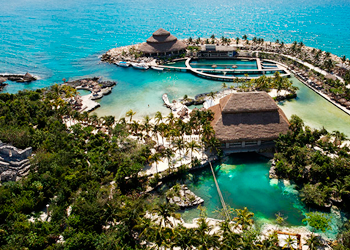 Sun and Sand, Maya Culture, ziplining, cenotes, diving and snorkeling, shopping and nightlife are just a few of the many exiting options Riviera Maya offers to provide their guests with a truly unique and marvellous experience. Is the most recognized tourism destination of the riviera maya and one of the most important beaches in the world. 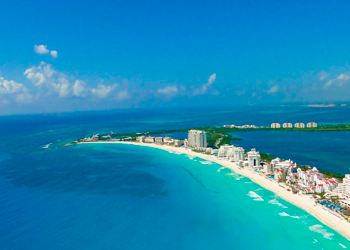 Cancún has also the biggest hotel infrastructure in the country and is the touristic city more developed. This “island” tourist zone (actually part of the world’s second-longest coral reef) has every thing you need for fun and enjoy the best of the caribbean sea. This Site is the only archaeological Maya site on the shore. This walled city dates from the post classic period and oers over 60 well preserved structures. 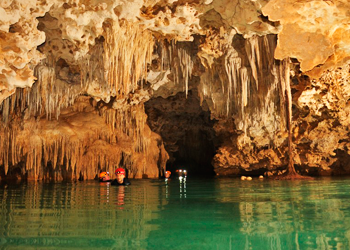 The Tulum area is also very famous for its cenotes. A cenote is a fresh water sinkhole connected to vast underground river systems that flow beneath the ground and connect several caves and caverns. Is a beautiful village where young people from all nations converge in harmony in to a endless party. A place for fun and enjoy of the best beaches of the Riviera Maya and some of the best “Resorts” in the zone. Is an ecoarchaeological park with many dierent attractions like an aquarium, butterfly pavilion and their famous Mexico Spectacular Folklore Show at night. A natural aquarium park considered the largest aquarium in the world, the perfect place to practice snorkeling and water activities. All Inclusive Adventure park with ziplining, swimming or rafting in underground rivers and amphibious vehicles. Discover the amazing underground world at this unique semi-flooded system of underground caves and caverns. classic period. Here you can climb the highest pyramid called the Nohoch Mul. Coba Maya Encounter: This excursion combines a visit to the archaeological site Coba with adventure activities in an authentic Maya village. About 30 km further south you find the village of Akumal. Akumal means ”the place of the turtle” in the Maya Language and it was the first settlement of what has become the Riviera Maya, funded 52 years ago. Inspite of tourist development the place has not lost it’s small village mentality and the atmosphere is laid back and friendly. The main attraction of the village is Half Moon Bay, the beach area in the center of the village. As the coral reef runs very close to the shore there are very little waves and almost no current, which makes this beach area ideal for family vacations. 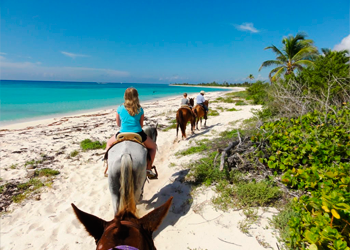 A ranch with 6 km of virgin beach where one can go horseback riding, ATV Tours, snorkelling on the reef or simply hang out at the Blue Venado Beach Club.